Why is Pattern Recognition Key for Traders? 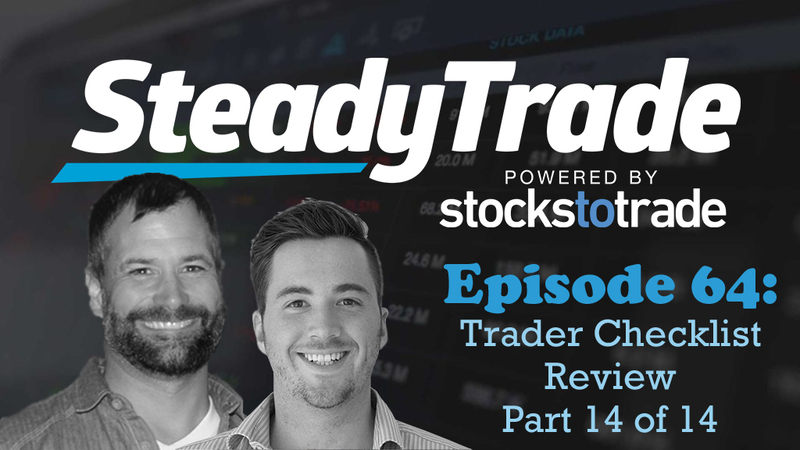 In this episode, the SteadyTrade Podcast presents our Trader Checklist finale (and an awesome contest announcement)! This is the final part of a new series, where hosts Tim Bohen and Stephen Johnson devoted 13 episodes to an in-depth review of the Tim Sykes video, Trader Checklist. Today’s episode features some parting advice from Tim Sykes and reviews some of the video’s key bullet points. Be sure to check out this episode on YouTube to see the accompanying video! Trader Checklist is a video by Tim Sykes that features 14 chapters of invaluable trading information and guest traders. It’s available for free online, so don’t miss out. On to the Trader Checklist finale! In these clips, Tim and Stephen go through 10 parting pieces of advice from Tim Sykes, presented two per clip. 1. Tim Sykes believes it’s possible to make millions as a trader. But it’s not common, and it’s not easy. It requires hard work, dedication, patience, study, tools, and mentorship. 2. 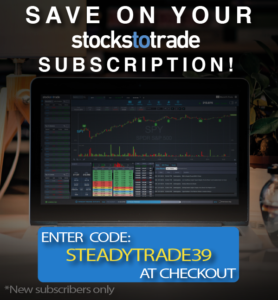 StocksToTrade helps make stock research easier. If you email admin@timothysykes.com and mention that you heard about it on the Trader Checklist finale, you’ll get special pricing for the program! The Steady Trade take: Tim and Stephen talk about the importance of the work and dedication in #1, and both add their thoughts on why a mentor can be extremely helpful. They both talk about why they’re big fans of StocksToTrade, too! 3. It’s all about pattern recognition. Tim Sykes teaches you about patterns and trends to help you get a good idea of what has worked in the past and what might work in the future. 4. You can be wrong on any trade. Getting cocky usually leads to failure. The SteadyTrade take: Regarding #3, both Tim and Stephen add their thoughts on pattern recognition, and discuss some of their favorite patterns. As for #4, they both talk about the all-too-common phenomenon of FOMO (fear of missing out) losses and how emotions and overconfidence are big problems in trading. 5. Trade scared so you’re not scared to trade. 6. Focus on small gains, as they can add up to millions over time. No, you won’t win every time. But small gains add up. The SteadyTrade take: As Tim Bohen cautions regarding #5, one trade probably won’t make your account. But one trade could make you lose all or even beyond all of your account. This is why it’s important to trade scared. In their discussion of #6, both Tim and Stephen offer great advice about how to stay disciplined while seeking out small gains. 7. Tim Sykes wants you to know: This guide is just the beginning of your education. You need constant study and education to really get ahead. 8. Do not copy picks or alerts from anyone else. Learn how to think for yourself. The SteadyTrade take: Both hosts agree that #7 is pretty self-explanatory … but #8 warrants additional discussion. They agree that while it’s great to watch what other traders do, you should never simply try to copy them. Learning to think for yourself will allow you to make your own choices with trades. This is what can help you have a solid, long-term trading career. 9. Tim Sykes doesn’t want just anyone to apply for his Trading Challenge. He only wants dedicated people. You need to prove that you deserve it. 10. Making money is great, and can be a powerful motivator. But take a long-term approach to trading for the best chances of finding success. The SteadyTrade take: Tim and Stephen discuss the benefits of Tim’s teachings, and focus on the importance of point #10. They state that if you want to get rich quick, you’ll probably get quickly turned off by trading. But if you can take a longer approach and develop a love for the process of trading, you may have just found a great new career path. From pattern recognition to FOMO, this episode is here to help you learn to trade steady. Are you ready to grow as a trader? Tune in — it might help you get there! Want to test your chops as a paper trader, and potentially win some incredible prizes? The SteadyTrade Podcast is pleased to announce that we’re hosting a paper-trading competition! We’ll kick it off with “auditions” for SteadyTrade listeners at the upcoming conference in Orlando, where we’ll choose six contestants. Hosts Tim and Stephen will each mentor three of the contestants — who will compete in the paper-trading competition. Each month, the contestant with the lowest score at the end of the month “goes home” until there’s one trader left standing. Each contestant gets six months free access to StocksToTrade. The winner gets a one-year subscription to StocksToTrade Pro. This is a killer opportunity to learn and get ahead! Do you have a question about this episode? Visit the “submit your audio” portion of the website to ask us anything. Thanks for tuning in to the SteadyTrade Podcast. Stay tuned for weekly episodes featuring the hottest topics for aspiring traders. Good finale to the Trader Check List Webinar series. I’m up for your competition, sounds like a good learning experience. I will be in Orlando, and I will probably sit a couple rows back from the front, just in case Stephen has been drinking! Great podcast fella’s, Aussie boy here so won’t make the conference but good luck to all. p.s. I have never followed an alert but would love a mentor so will chase one of you some day in the future.